Background: As a 38th-round pick by the Mets in 1999 out of Grossmont (California) Junior College, Mike Jacobs was always an unlikely major league star. Jacobs received a chance at big league at-bats after a trade from the New York Mets to the Florida Marlins as part of the exchange for superstar slugger Carlos Delgado. 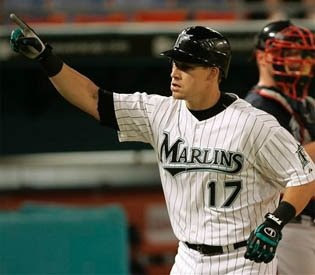 What the Scouts Say: Jacobs has hit 80 home runs and slugged .498 in four big league seasons making him a major power source for the often cash-strapped Marlins. As a Marlin, he has just a .318 on-base percentage. He cannot hit lefties (.235/.275/.414 versus them in 338 career plate appearances) but is acceptable against righties (.257 average and .315 on-base percentage in 2008). He is not much of a base runner and is below average defensively at first base. What the Stat Guys Say: Sabermetricians will question why the Royals, who presently hold the rights to a wide variety of cheap alternatives at the first base and designated hitter spots, would spend their assets (even one as limited in ceiling as Leo Nunez) for a player that isn’t very good and not much of an improvement over players already on the forty-man roster. Kila Ka'aihue had a nice season at triple-A but needs to demonstrate that he has actually made a step up in performance level before the Royals can commit to him at the major league level. Ryan Shealy is now 30 years old and has yet to perform in the major leagues on a consistent basis. Counting on either of those players to outplay Jacobs would be a lousy bet. Billy Butler has been highly touted but has yet to perform in the majors and is not a favorite of Royals general manager Dayton Moore. Jacobs hits fly balls and line drives at good rates for a power hitter. His BABIP suggests that he was unlucky last season (.264 in 2008 compared to his career rate of .292) and indicates that he could rebound slightly even though moving to the tougher American League. Fantasy Outlook: Look for the Royals to platoon Jacobs in the lineup with right-handed first baseman Ryan Shealy to maximize their production at first base. As the left-handed batter in the platoon, he should see enough at-bats to be an asset to fantasy teams. Do not be surprised if the platoon is not a conventional one. For defensive reasons Jacobs may appear as the designated hitter in order to get top prospect (and equally poor on defense) Billy Butler some games in the field. Fantasy leaguers can expect solid power and a just barely acceptable average from Jacobs in 2009.